The SweetRush SPARK team came up with a brilliant solution to the virtual reality content distribution challenge. Picture this: You and your best friend get together every weekend over the summer to make marmalade. You buy fruit at the farmers’ market and you meet at your house to make the jam. Then you give it away to your family and closest friends, who all come to love the sweet treat. One day, you both decide to make a profit off your now-famous jam. Once the jam is ready, however, you face a big problem: How do you get it to your potential buyers? Distribution, as you can probably guess, is a big deal when you offer any kind of product, even if it’s digital. With virtual reality (VR) experiences for Learning and Development (L&D), SweetRush’s SPARK team – which focuses on emerging technologies – discovered VR content distribution was a significant hurdle impeding the adoption of this new and exciting technology. VR has reached an inflection point and there is tremendous industry interest. Vendors in the L&D industry are creating VR experiences for clients, and exploring the value of emerging technologies such as VR, augmented reality (AR), artificial intelligence (AI), and custom apps. Here’s an example: A prominent hospitality brand, committed to providing their employees with highly engaging learning experiences, saw VR as a unique tool for workplace learning because it’s a fully immersive experience, in which learners interact in a simulated environment. It completely captures learners’ attention, which leads to higher levels of engagement and retention. In this instance, VR offered the perfect next-level learning experience. It allows corporate-level workers to experience the reality—environment, needs, pressure—that hands-on hospitality workers deal with daily. The net result was that it achieved the desired goal of fostering empathy. However, when it came time to deploy the app, the size and nature of this global enterprise created a major distribution problem, much like our jam at the beginning of this article. How could this organization distribute their virtual jam to their worldwide enterprise? The complications do not stop there. As Cascante explains, if our team developed a newer version of a previously installed VR course, we would need to reinstall the whole package of files—we’re talking about 5 to 10 gigabytes in most cases, sometimes more—in each machine manually. This is a less-than-ideal scenario. To distribute VR, one would need to download and setup files, and figure out how to launch the VR experience. One would also need to do so all over again for each new version of the VR course. This is arduous, time consuming, and a significant hurdle to the adoption of this otherwise innovative technology. If you play games, you are likely familiar with Steam, a game distribution platform developed by Valve Corporation. Steam solved the same distribution challenge for game developers and players. 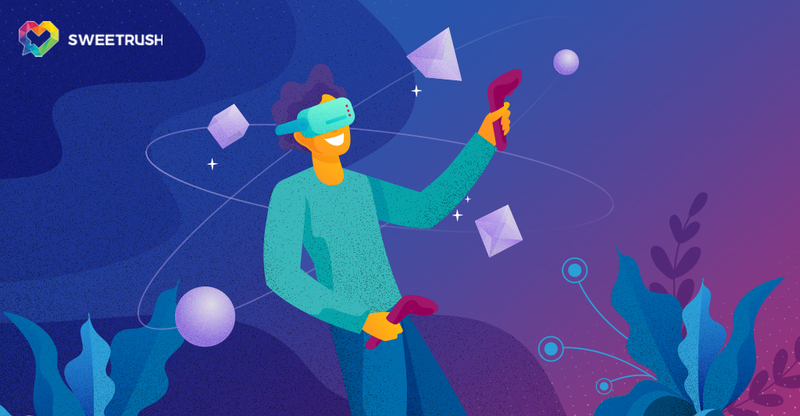 A similar distribution platform for virtual reality could solve this major hurdle for organizations wishing to integrate VR into their workplace. After looking at the market and not seeing an easily available alternative, SweetRush decided to develop its own tool for distribution, the SPARK VR Platform. In it, users can log in and browse through their available VR experiences. From there, the steps are rather intuitive and simple. Users simply click the download button and wait for the download and installation process to complete. Then, they can launch the VR experience from the platform itself. They can also use it to launch previously installed experiences while they download new ones. Now clients can easily distribute VR anywhere in the world with ease. The interface is consumer-focused and user-friendly, with a rolling carousel and an intuitive front end. Users can easily monitor the progress of their download. Another great feature is the smart download. This feature speeds updates by downloading and replacing only necessary files, rather than doing a full reinstall every time there’s a new version. All of us in the L&D industry are all excited about the potential of virtual reality and how a fully immersive experience can be leveraged to increase learner retention and enable performance improvement. Solving the VR content distribution challenge is an essential, building-block challenge that was inhibiting the momentum of this truly exciting new tool all of us are eager to engage. Here’s to immersive engaging and immersive learning! The SweetRush SPARK team came up with a brilliant solution to the virtual reality content..